Put down your Suffocation, Cannibal Corpse, Obituary, Death & Morbid Angel albums.....and listen to these instead! Part 1 of our under-appreciated classics of American death metal highlighted the likes of Oppressor, Infester & Morta Skuld among others but there’s plenty more quality death from the good ol’ U.S of A still knocking around, often found collecting dust at the bottom of the death pile….which is tantamount to sacrilege! Instead, Part 2 attempts to draw attention to those albums which often find themselves cast aside in favour of the big guns of death metal and serves as a mere introduction to the sheer quality of death metal which boiled away in the underground of the late 80’s to early/mid 90’s! New York death metal par excellence, Morpheus Descends may not be as well known outside of niche death metal circles as Immolation but in 1992, these guys were the superior act, with Ritual Of Infinity proving to be a proto-tech death album of unrivalled complexity and shattering talent! Dank, dark and decidedly devilish, Morpheus Descends were capable of nerve-severing ferocity while still maintaining a level of ‘catchiness’ which would appeal as much to the neck-muscles as those over-stimulated cerebral’s. 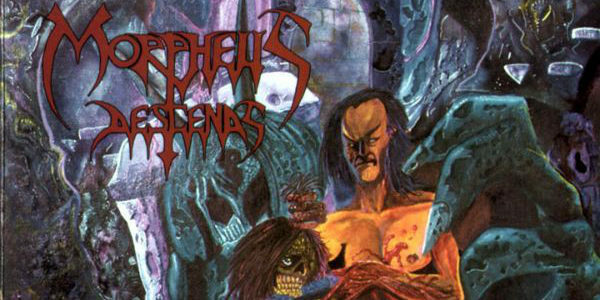 With one foot in the old-school and one in the still-opening door of technical death metal’s future, Morpheus Descends certainly paved the way for those bands who morphed traditional death metal into ever-changing sounds as the decade drew on. Morpheus Descends were there at the beginning though, and Ritual Of Infinity – their only full length album – remains a milestone of jaw-dropping intensity. What do you think of Master? Does it fit into this category? “On the seventh day” is an absolutely classic and I think the band never received the recognition they deserve. Theres two more for you. In case the list ever gets to 4 or 5. Although being published by Earache, I think Massacre – From Beyond didn’t get the attention it deserves. Vital Remains – Let us pray. Don’t know if Demolition Hammer or Sadus qualify as being death metal enough, but they both need more love. I painted the cover art for MORPHEUS DESCENDS, “Ritual of Infinity”, and it is STILL a subject many want to talk about, when I do art gallery shows!